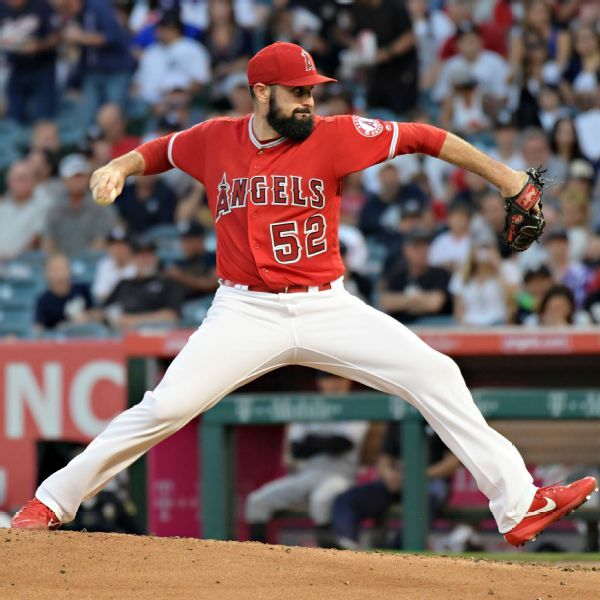 The Los Angeles Angels have placed oft-injured starting pitcher Matt Shoemaker on the 10-day disabled list because of a right forearm strain. The move was made retroactive to Sunday. Right-hander Parker Bridwell was recalled from Triple-A Salt Lake to take Shoemaker's roster spot. Shoemaker (1-0) gave up three runs and four hits in 5 2/3 innings against the Athletics Saturday. He struck out four and walked four while improving to 5-0 with a 2.38 ERA in his last seven starts against Oakland. Shoemaker, 30, hadn't started a regular-season game for the Angels since June of 2017 as he underwent season-ending surgery to release the radial nerve in his right forearm. Prior to that, he was 6-3 on the season with a 4.52 ERA. The 2017 injury marked the second straight year that Shoemaker's season ended prematurely. In September 2016, he took a line drive to the head that resulted in a fractured skull and required emergency brain surgery. The Angels also announced Japanese two-way player Shohei Ohtani will pitch Sunday, his first start at home.